عندما تزور أوكلاند, ستشعر أنك في بيتك في Econo Lodge City Central الذي يقدم لك إقامة متميزة و خدمات عظيمة. يمكن من هنا للضيوف الاستمتاع بسهولة الوصول إلى كل ما تقدمه هذه المدينة النابضة بالحياة. بالنسبة لمن يريد الخروج، هذه بعض المعالم السياحية المتوفرة للزوار ‪St Matthew-in-the-City Church‬, Elliott Stables, سيفيك. كما يقدم Econo Lodge City Central الكثير من الخدمات لإغناء رحلتك في أوكلاند. يقدم الفندق تسجيل وصول/خروج سريع, تخزين الأمتعة, واي فاي في المناطق العامة, غرفة عائلية, تأجير سيارات لضمان الراحة القصوى لضيوفه. ادخل إلى واحدة من الغرف 105 وتخلص من عناء نهار طويل بمساعدة مجموعة كبيرة من الخدمات كمثل تلفزيون بشاشة مسطحة, سجاد, قهوة فورية مجانية, شاي مجاني, بياضات الموجودة في بعض الغرف. كما أن مجموعة الخدمات الواسعة الموجودة في الفندق لضمان راحتك تترك لك الكثير من الخيارات لقضاء وقتك أثناء فترة إقامتك. يشكل Econo Lodge City Central بخدماته الراقية وموقعه الممتاز، قاعدة مثالية للاستمتاع بإقامتك في أوكلاند. يجب دفع مبلغ تأمين بقيمة AUD 200 عند تسجيل الوصول لتغطية أي تكاليف أو أضرار قد تحدث أثناء فترة الإقامة وسيتم إعادته عند المغادرة. يتوفر مكان لانتظار السيارات في العقار المجاور وهو فندق كراون بلازا بمعدل دخول وخروج مرة واحدة مقابل رسم إضافي يبلغ 21 دولار أسترالي لكل 24 ساعة. مكان انتظار السيارات من الساعة 17:00 to 10:00 costs دولار أسترالي 11. تتطلب جميع الحجوزات التي تم إجراؤها من خلال مواقع إلكترونية خارجية أو مباشرةً بطاقة هوية صالحة (رخصة قيادة أو جواز سفر أو بطاقة +18) وبطاقة ائتمان، وذلك عند تسجيل الوصول. ينبغي أن يسدد النزلاء الذين ليس لديهم بطاقات ائتمان عن طريق نظام دفع EFTPOS أو سداد وديعة نقدية قيمتها 200 دولار أمريكي. يُرد مبلغ السند التأميني عند المغادرة بعد فحص الغرفة وتسوية الحساب. The disappointing portion of this review is primarily due to internet (wi-fi) which was slow while only allowing only 300 MB per day, barely enough to check a few emails. Internet (wi-fi) never enough to communicate with family or friends via video (Skype, FaceTime) or cruise FB when there is inclimate weather. My room was VERY small but as a single person I made due, albeit barely. For a female I think this would be a bit disappointing since there was no counter space in the bathroom to set anything. All this being said, the room was clean, the staff nice and helpful, the location very good in my opinion. Father Ted's Irish bar close by (same block), with good food and drink, theater and food (mostly Asian) court across the street along with other eateries and shopping. Another great thing about the location is the "Sky Bus" to and from the airport is close @ hand. BTW, this is my second stay @ this facility and I would stay again if traveling through NZ. The place is easy to find and was very close to our conference (SkyTower) and the Civic Theater but not as expensive. There was no parking in the area because of the construction right in front of the hotel but this could not be helped. Access to wifi in our room was limited to 100Mb per day and ran out more quickly. The staff were helpful and readily provided advice/recommendations when asked. The tap was not as nice...with one tap for cold and another tap for hot water - we preferred one tap wherein temperature could be regulated. The noise from people on the streets or in the pub were still heard inside the room even if we were already on the 6th floor on some days, were not the best but was tolerable. Overall, we liked our stay at this place. As said good location. Facilities in room however need upgrading eg cupboard, binds n wash basin need are old. 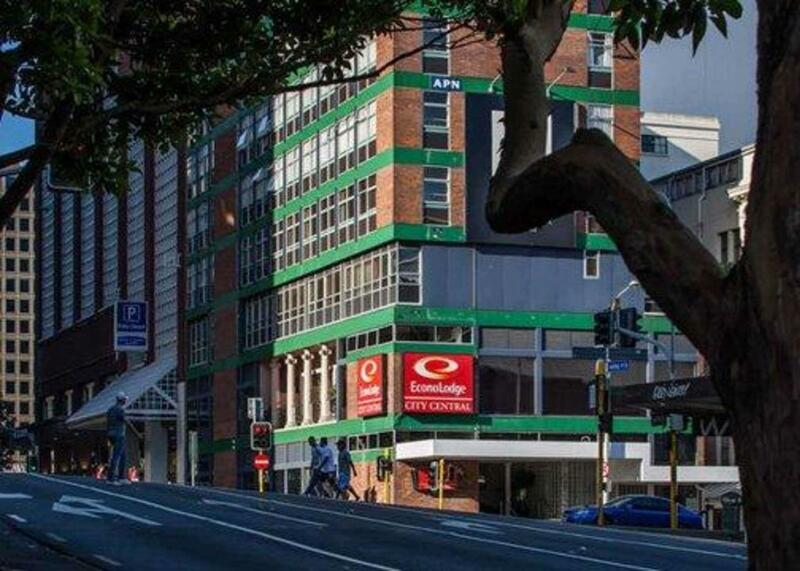 Perfect location .. .. everything is within walking distance, if you are ok with walking .. 15 min walk to the docks, ferry, britomart bus/ train station ... plus buses on queens etc.. Granted lots of hills but that is Auckland in general. We felt the location was great and everything was walkable .. it was also easy to take the bus or ferry ( $13.50 for 2 ) to Devenport, or bus to Sylvia Park or Mission Bay. Very good customer service. we booked a room with balcony but due to some booking issues from the service provider we ended up some other room without balcony. But when we told this issue to the staff, they did their best to help us, to approach the service provider and later gave us our booked room with balcony. They were extremely helpful and supportive. 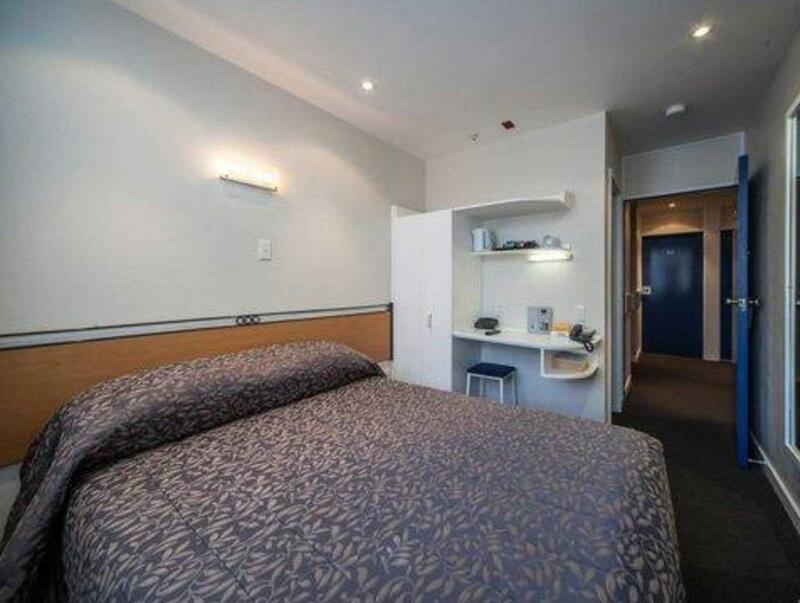 Compact Double Room: Strategic location enable to access Sky Tower, Sky Bus hub, supermarket, and etc easily. The noises from people on the street and the construction site can be heard during the night although staying at 5th floor. No air conditioning, microwave, and refrigerator as stated in Agoda. Overall, it's value for money on the strategic location. I had to pay for an upgrade to get a room with air-conditioning and a fridge. The upgraded room was compact but fine though I wonder what the originally booked standard room was like. Can't fault the location. If you're a budget traveller, I guess hostels would be the first thing in your mind. But after weeks of hostels - sharing rooms, bathrooms, and not to mention lugging stuff on places without elevators or too far from places you should be ....This hotel is a God-send. 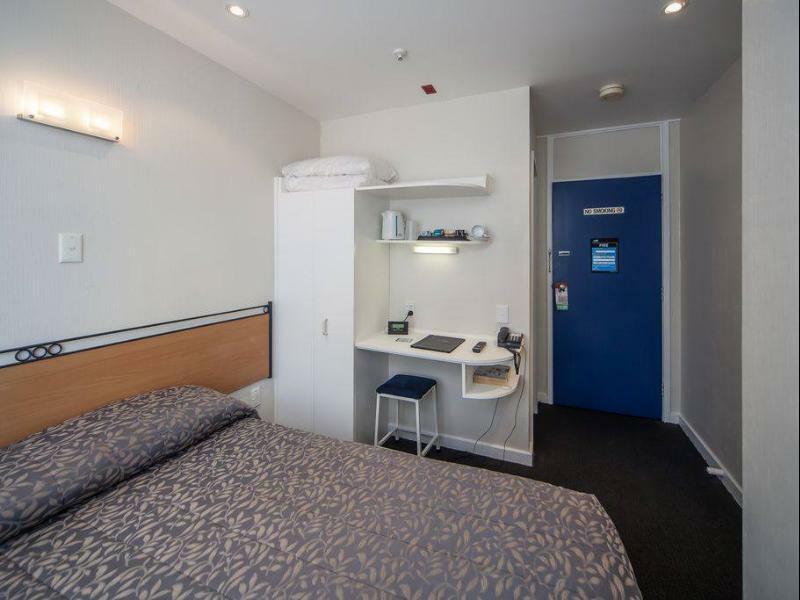 I tried two budget hotels and hostels in Auckland, but after trying this amidst the not so great rating, this will now be my go-to hotel in Auckland. Sure it's not five star but hey I'll take this over hostels. Location is dead center. It's near everything. What I love is that it's near the Intercity bus station - for the tours. The room maybe small (I got a compact double) but it works for me. My own bed and bathroom. Price is ok. Moreover, it's clean. Breakfast is 14.50 nzd for continental buffet which is better than toast and peanut butter. They have free wifi but after you used up the allotted mb for the day, you have to buy. If you don't use that much like me, no big deal. Staff is ok. They will do their best to help you. My only complaint is that they should soundproof some rooms cuz it can get noisy as you're near a busy road. But overall, I like this place. I plan a lot of visits to NZ and this hotel will be included in those. 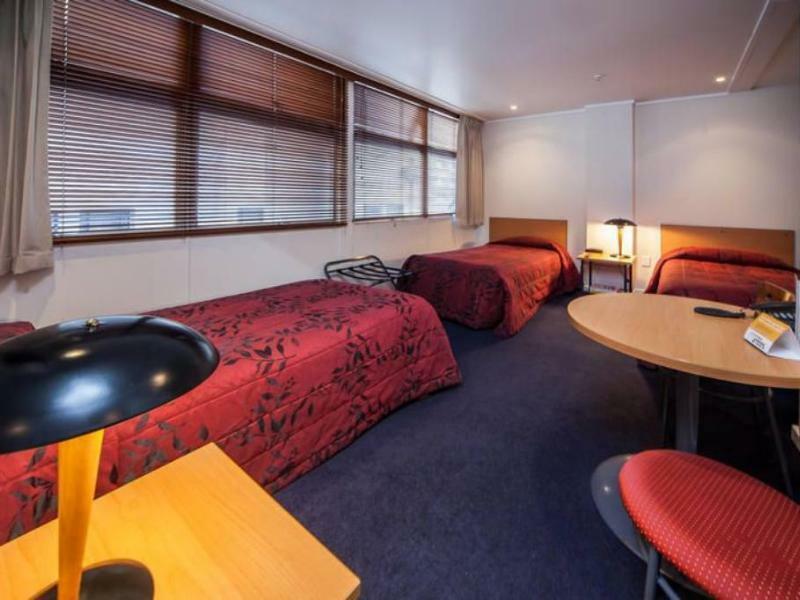 Travel with mum in March, stay in Compact Twin Room, room 506. 1. Environment is ok, however the mattress is too soft. Choose other hotel if need harder a bit mattress. 2. Kettle is provided in the room, however, there is no way to check the cleanliness inside the kettle. We choose not to make any hot drinks although they provide coffee and tea packets. Quad Room was great & spacious enough for family of 4. Room and bathroom were clean. With hot water & aircon. Great location. Friendly staff. No aircon in summer perhaps too hot. Other things all okay. Staff are welcoming and accommodative. Rooms are old but functional. Most importantly it's clean. She forgot to give us Wifi assess and when my friend asked to take one, she refused and asked us to go to our rooms to find it ourselves. When we did so, no so-called Wifi Assess info inside, so we went downstair again and Dana yelled at us and lied to us that WE FORGOT to take the password. So unpleasant experience I've ever had!